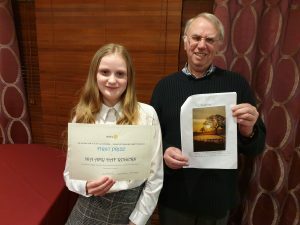 Rotarians were full of praise for Nia Amy Haf Rogers from Trelogan, winner of the Young Photographer Competition 2019. 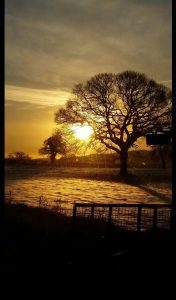 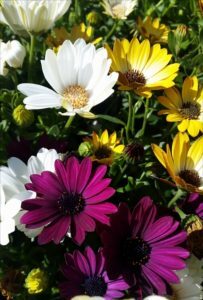 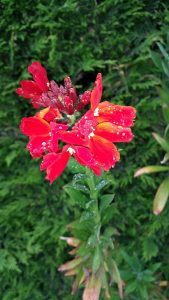 Nia, just 14 and a student at Ysgol Garmon, submitted a superb portfolio of 3 pictures on the theme ‘The Beauty of Nature’, which the judges said captured so brilliantly nature at its best over 3 seasons. 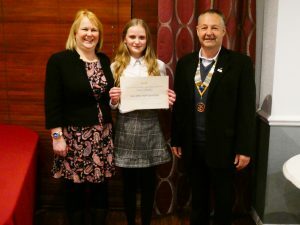 Nia is shown with her mother, Suzanne, receiving her prize from Rotary President David Roberts.